TM 9-2350-261-34 REPAIR ROADSIDE AC POWER EXTENSION BOX A18 (M1068 ONLY) DESCRIPTION This task covers: Disassemble (page 21.1-52). Clean, Inspect, and Repair (see Chapter 2). Assemble (page 21.1-53). INITIAL SETUP Tools: References: Automotive Fuel and Electrical System Repair See your -20 Tool Kit (Item 7, App B) Equipment Conditions: Marterials/Parts: Roadside AC power extension box Al8 Locknut (24) removed (see your -20) Personnel Required: Fuel and Elec Sys Rep 63G10 DISASSEMBLE NOTE See wiring diagram for assem- ble/disassemble of wires to connectors. 1. 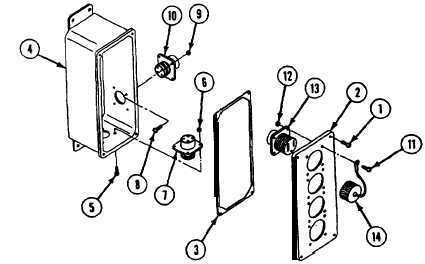 Remove four screws (1), cover (2) and gasket (3), from extension box (4). NOTE Tag all leads before disconnecting for proper assembly later. The four screws that secure connector J1 are shorter. Do not mix with other con- nectors. 21.1-52 Change 4 2. Remove four screws (5), locknuts (6), and connector J6 (7) from extension box (4). Discard locknuts. 3. Remove four screws (8), locknuts (9), and connector J1(10) from extension box (4). Discard locknuts. 4. Disconnect leads from connectors if necessary. 5. Remove 16 screws (11), locknuts (12), four connectors (13), and dust caps (14) from cover (2). Discard locknuts.